The guide to collecting Star Wars Legends, the old Expanded Universe, comic books by Marvel and Dark Horse. Find every omnibus, Epic collection, hardcover, and trade paperback in reading order. Part of Crushing Krisis’s Guide to Collecting Star Wars Comics. Last updated November 2018 with titles scheduled for release through June 2019. These 30 years of comics were removed from canon (along with nearly everything else that wasn’t a film or TV show) in 2014 when LucasFilms announced the impending Episode VII and the move of their comics license to Disney sibling Marvel Comics. That means these stories have all been rendered inessential to the current Star Wars universe. Compared to current canon, these stories range from alternate retellings to complete fiction, much as we regard children’s stories and fairy tales. Marvel’s original Star Wars material is primarily collected in three formats. The most high-end format is the Marvel Omnibus, oversized hardcover books with premium reproduction. Both Marvel and Dark Horse also reprinted this run in paperback in collections that were not released in chronological order – Marvel’s versions are Epic Collections and Dark Horses versions are Omnibuses. 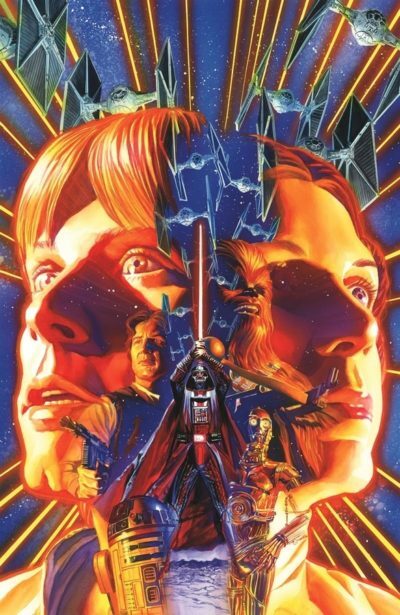 This book starts with an adaption of A New Hope in issues #1-6 and ends with adaption of The Empire Strikes Back. Collects Star Wars (1977) #1-44 & Annual 1. This book starts with a brief prologue to Return of the Jedi and then the adaption of that film and continues to end of Marvel’s original Star Wars license. Collects Star Wars (1977) #79-80, Return Of The Jedi #1-4, Star Wars (1977) #81-107 & Annual 3 and material from Pizzazz #1-16, Star Wars Weekly (UK) #60, 94-99, 104-115, Empire Strikes Back Monthly (UK) #149, 151, 153-157, and Star Wars (UK) #159. A joint publication between Marvel and IDW. Contains strips from March 11, 1979 to October 5, 1980. These are not oversized tall books like the omnibuses, but wide hardcover books in the shape of a newspaper strip. Collects Star Wars (1977) #1-23, material from Pizzazz #1-16 and Star Wars Weekly (UK) #60. 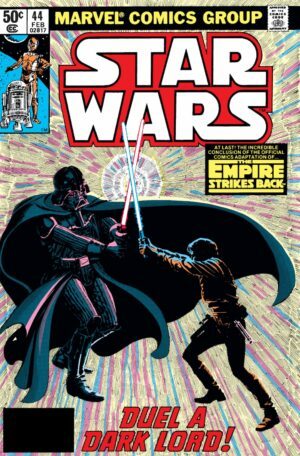 Epic Collection is not yet announced for material from Return of the Jedi and on from Return of the Jedi #1-4 and Star War (1977) #81-107 and Annual 3. 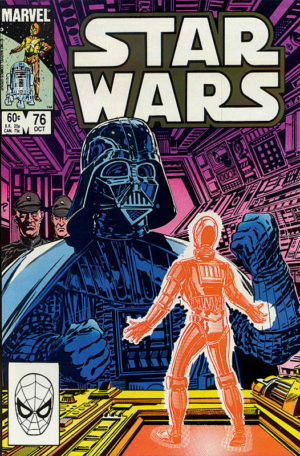 Collects Classic Star Wars #5-20 and material from #4. 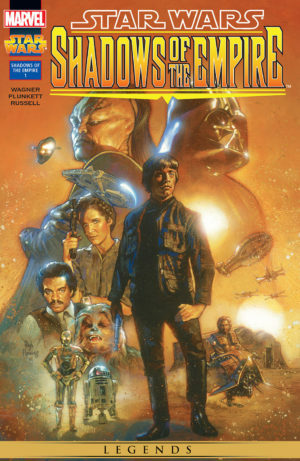 Dark Horse took over the Star Wars license in 1991 and printed 25 years of in-universe comics that complemented the continuity of Star Wars novels. Most of the material was originally collected in trade paperback by Dark Horse and then later recollected in a series of paperback Omnibuses, which were released non-sequentially. Marvel is gradually recollecting Dark Horse’s material in Epic Collections, which are also released non-sequentially. This ancient period covers just two years – 25,793 – 25-792 BBY. This period begins with Tales of the Jedi stories circa 5,000 BBY, then leaps forward a millennium for stories from 4,000 BBY to the 3,990s and 3,980s before Knights of the Old Republic begins in 3964 BBY and runs through 3,643 BBY. Afterwards, a smattering of stories cover 2,974 BBY to 1,000 BBY before continuity leaps forward nearly another millennium to Prequel-era stories. Epic Collections are not yet announced for the beginning of this period. 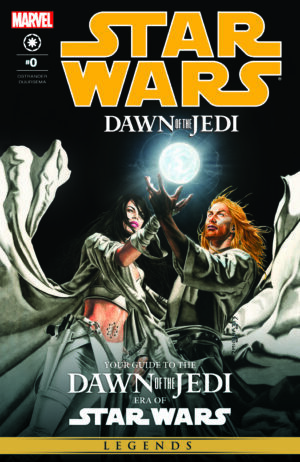 It will likely be contained in two collections, including Tales of the Jedi – The Golden Age of the Sith (1996) #0-5, Fall of the Sith Empire #1-5, Ulic Qel-Droma and the Beast Wars of Onderon #1-2, The Saga of Nomi Sunrider #1-3, The Freedon Nadd Uprising #1-2, Dark Lords of the Sith #1-6, The Sith War #1-6, and Redemption #1-5. 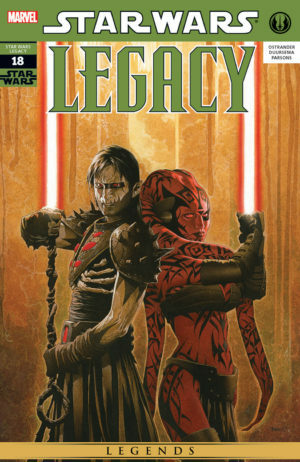 It’s unclear where Lost Tribe of the Sith: Spiral #1-5 will be collected, as it occurs after the Lost Tribe of the Sith: Pandemonium novel in 2974 BBY – disconnected from the continuity of stories one either side.. While not announced, based on the year breakout of the series placement, this collection would collect Knight Errant #0-15 and Star Wars: Jedi vs. Sith #1-5. This period starts in 53 BBY and runs through The Phantom Menace at 32 BBY to Revenge of the Sith in 19 BBY. Star Wars: Episode I – The Phantom Menace occurs during the next Epic Collection. Star Wars: Episode II – Attack of the Clones occurs here. Star Wars: The Clone Wars begins here. This collection covers stories that occur after Attack of the Clones and the Battle of Geonosis, which places the start of this collection just prior to Episode 6 of The Clone Wars. 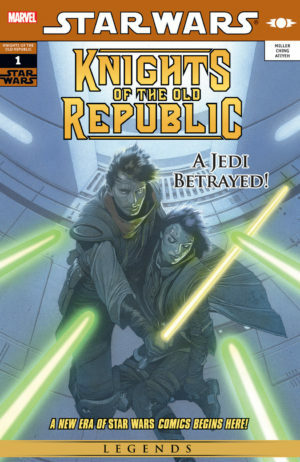 Collects Star Wars: Republic #49-54; Star Wars: Jedi One-Shots (Mace Windu, Shaak Ti, Aayla Secura, Count Dooku, Yoda); and material from Star Wars Tales #14 & 19 and Star Wars Visionaries OGN. The Star Wars: Clone Wars pilot film occurs here. It’s unclear of Epics would also collect The Clone Wars cartoon tie-ins comics, including Star Wars: Clone Wars Adventures Volume 1-10, Star Wars: The Clone Wars Magazine, and Reversal of Fortune web comics. Star Wars: Episode III – Revenge of the Sith occurs here. This period begins in 19 BBY, just after Revenge of the Sith, and continues to events just prior to A New Hope in 0 BBY. Collects Star Wars: Droids (1994) Special and #1-6 (AKA The Kalarba Adventures #1-6); material from Star Wars Galaxy Magazine #1 (between Kalarba 5-6); Star Wars: Droids (1995) #1-8 (“Rebellion” and “Season of Revolt”); Droids: The Protocol Offensive OGN; and material from Star Wars Tales #16 & 20. Contains stories from A New Hope in 0 BBY through the end of Return of the Jedi in 4 ABY. Marvel’s original Star Wars series occur in this period, and is collected separately as described above. Epic Collections have yet to be announced for Star Wars: Shadow Stalker (1997) #1 (which was expected to be in Rebellion Vol. 3), Star Wars: Rebellion (2006) #0-16, Star Wars: Splinter of the Mind’s Eye (1995) #1-4, and Star Wars: Rebel Heist #1-4, [The Empire Strikes Back fits here], and Shadows of the Empire #1-6. This era ends with the closing scenes of Return of the Jedi. 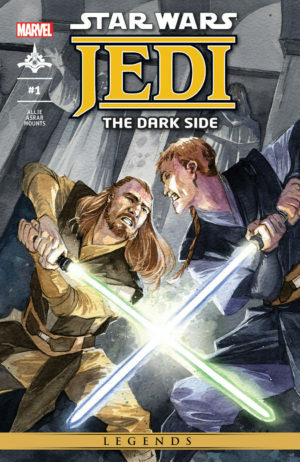 Star Wars: Mara Jade (1998) #0-6 begins during RotJ, but is collected with the next era. Star Wars: Shadow Stalker (1997) #1, Star Wars: River of Chaos (1995) #1-4, Star Wars: Splinter of the Mind’s Eye (1995) #1-4, Star Wars: Vader’s Quest (1999) #1-4, Star Wars: Tales from Mos Eisley (1996) One-Shot, and material from Star Wars Galaxy Magazine (1994) #2-4 & 9-12. Stories from after Return of the Jedi in 4 ABY through 19 ABY, and then the “Invasion” event in 25 ABY. Keep in mind that The Force Awakens was not canon in the old Legends Expanded Universe because it didn’t exist yet, but also because the story went in a different direction! For example, Han and Leia did not have a son named Kylo Ren in this continuity. Collects Star Wars: Mara Jade (1998) #0 (web comic) & 1-6 (“By The Emperor’s Hand”), Star Wars: Shadows Of The Empire – Evolution# 1-5 (Note that this occurs between Rogue Squadron #12-13, which are in the next volume), Star Wars: The Jabba Tape, Star Wars: Boba Fett – Twin Engines Of Destruction; and material from Star Wars Tales #1, 3-5, 10, 14-15, 20 & 22. Collects Heir to the Empire #1-6, Dark Force Rising #1-6, and The Last Command #1-6, all adaptations of the classic Thrawn Trilogy of Novels. 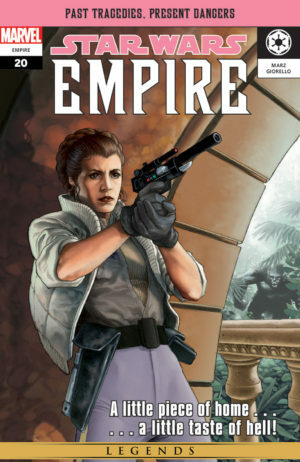 Epic Collections have yet to be announced for Dark Empire #1-6, Dark Empire II #1-6, Boba Fett One-Shots (Bounty on Bar-Kooda, When the Fat Lady Swings, & Murder Most Foul), Empire’s End #1-2, Boba Fett: Agent of Doom, Crimson Empire #1-6, The Bounty Hunters: Kenix Kil, Crimson Empire II: Council of Blood #1-6, Jedi Academy: Leviathan#1-4, Crimson Empire III: Empire Lost #1-6, and Star Wars: Union #1-4. Epic Collection titled “Invasion” would likely collect Invasion #0-16 and Chewbacca #1-4, which are set six years later than the other material in this period. Collects Star Wars: X-Wing Rogue Squadron (1995) #1-8, Star Wars: X-Wing Rogue Squadron: Rogue Leader (2005) #1-3, and Star Wars Handbook (1998) #1. A comic adaptation of George Lucas’s original script draft of Star Wars.